The Roald Dahl Museum and Story Centre, opening in Buckinghamshire, hopes to inspire a new generation of creative minds. Chloe Curtis is at the Automatic Grammatizator, building bizarre words and phrases into a story. "I'm hoping she's going to make a fun one or a rude one," says her mother, Morag Bremner. Morag is from the design team behind the Roald Dahl Museum and Story Centre, which opens in Great Missenden on Saturday. 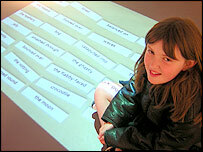 The grammatizator is one of many interactive exhibits and, with lights, projects words on to the floor. "For a lot of children, words can be quite frightening," says Morag. "In his books Roald said 'you can make up the words, you can do this." The room is meant to inspire children's imagination with it's "ideas table", movie-making exhibits, fridges covered in words and advice from popular authors. 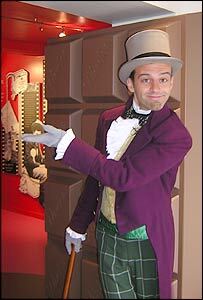 Behind Willy Wonka-style chocolate doors, the museum has galleries about the late author's work, a comprehensive archive, family letters, video and photographs. A replica of the hut where he wrote classics like Charlie and the Chocolate Factory and Matilda stands in the former coaching inn's courtyard. It comes a month ahead of the release of a new Charlie and the Chocolate Factory film, starring Johnny Depp, and a BBC documentary on Dahl. For granddaughter and model, Sophie Dahl, it is the museum's room on his earlier life at school and in the RAF, which is "fantastic". 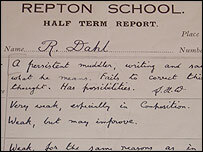 His 1930 school reports from Repton in Derbyshire described him as a "persistent muddler, writing and saying the opposite of what he means. Fails to correct this..."
"I like that now we get to see him as a little boy, him as a man, him as a writer," says Sophie. "There's nothing more reassuring for children to see a school report and that he didn't do very well in Latin - yet went on to do great things." Her brother Ned Donovan, 11, a fan of The Twits, is also drawn to the museum's toilets. "As soon as you go in, they start making noises like 'whizzpop'," he says. They also recite stories and commands - 'I will not eat worms' plays out in the Ladies. The museum shows how Roald Dahl wrote - from his ideas books through an illuminated dreamcatcher for creating BFG-like dreams to giant versions of the imported yellow notepads and pencils he used. The drafts and redrafts of stories - cut and pasted in the original sense, with scissors and sticky tape - display how he crafted tales for adults and children. How James and the Giant Cherry became a 'Peach'. Dahl wrote in a hut in the garden of the nearby family home in the morning and afternoon. But at his children's bedtime he climbed the stairs, to begin their own stories and excerpts from books, including The BFG. Dahl's daughter, Ophelia says: "He had a wonderful ability to keep the story going, to keep the thread. It was magical." But he did not try out his drafts on his children: "He was pretty confident in his own imagination," she says. The museum will host school trips - but 'hated' worksheets will be outlawed. Instead, children can use their own 'ideas books' to jot down any inspired thoughts. For Ophelia, the museum is: "Not about absorbing his work, it's about finding a place where (children's) own imagination can roam and take flight." 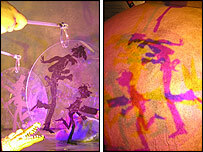 Dahl's second wife Liccy began the project 10 years ago. Surveying the finished result she says he "might have wept, a little. He would have been touched and moved". Museums, she says, are one of the things Roald "really despised" in life - as well as "beards, committees and speeches". "I wanted to prove that Roald was wrong, that museums need not be boring." Cherie Blair opened the museum to special guests on Friday, alluding to The Witches. In choosing her outfit, she said: "I made sure everyone could see my toes, no gloves, no wig." The newspapers could be "positively confident I am not the Great High Witch". The museum's director Sue Davies hopes it will provide a place for children and adults to get into a "creative groove". That process is already under way for Rachel Miller, 11, who is standing in a room full of photos of Dahl's 74-year life to 1990. "I've been looking at things he has done and writing them down, and having ideas so that when I grow up that can start me off," she says. "I write fantasy, fairy tales with people getting saved - someone gets captured and their brother or sister has to try and save them." In the story centre, famous children's authors talk about their approach to writing. "Someone somewhere," booms the voice of His Dark Materials author Philip Pullman, "is writing the next big sensation - and that might be you."